In this episode, I’m going to show you a cost effective tool which helps me save time and bring in new leads every single day in my businesses. The tool I’m going to show you today is LeadPages™ by the team behind LeadPlayer, which I also use across my sites. I’m going to jump right now into a little screen cast and show you how I use it and how you can also utilize it in your own business to save you both time and bring you, most importantly, more business. As discussed, I want to show you LeadPages™ which I use on a daily basis across all of my businesses. It’s a fantastic tool. It’s so quick and easy to use and to deploy across all of your sites. I’m going to show you exactly how easy it is to create a page, intergrade it with an email autoresponder or an email up team software and also some other products which it integrates with. Let’s take a look at that now. I am in the dashboard for LeadPages™. As you can see, it is relatively straightforward and simple which I really love. 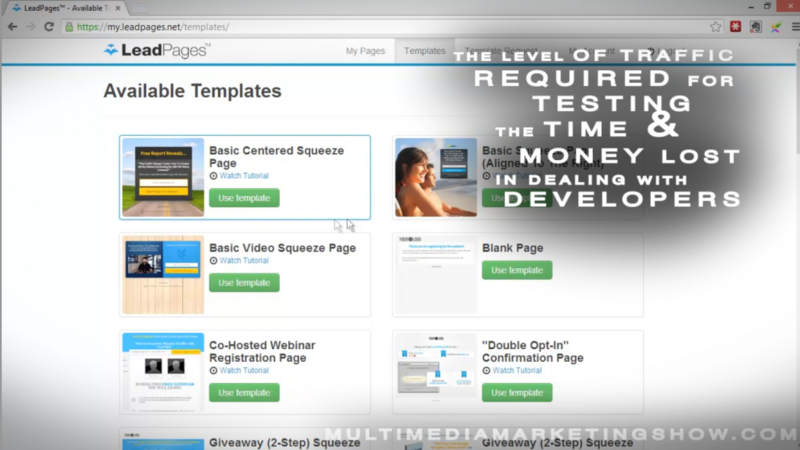 Right now, you’ve got a number of different templates which include things like opt-in pages or squeeze pages. 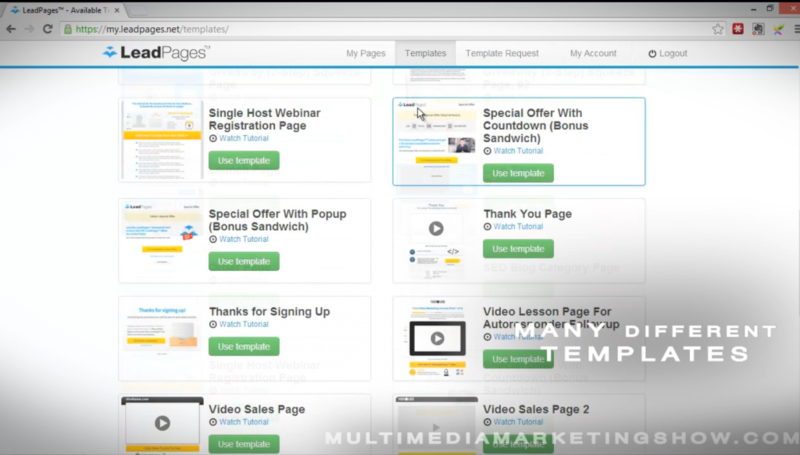 You have some webinar registration pages, double opt-in pages which are fantastic, some give away pages which you can utilize as a WelcomeGate. Easy Customization – No HTML Knowledge Required. I’m going to show you now, some of the pages which I’ve implemented across my sites. You can see I’m using them for so many different things. This one for instant is a thank you for joining. Once someone signs up to our email list, that will be sent to this page here where they can watch a video. One of the great things I’ve found is that this has increased the amount of people liking me on Facebook and number two importantly, you can actually then direct people to take a second reaction which is to sign up for a webinar or something like that which I have here. 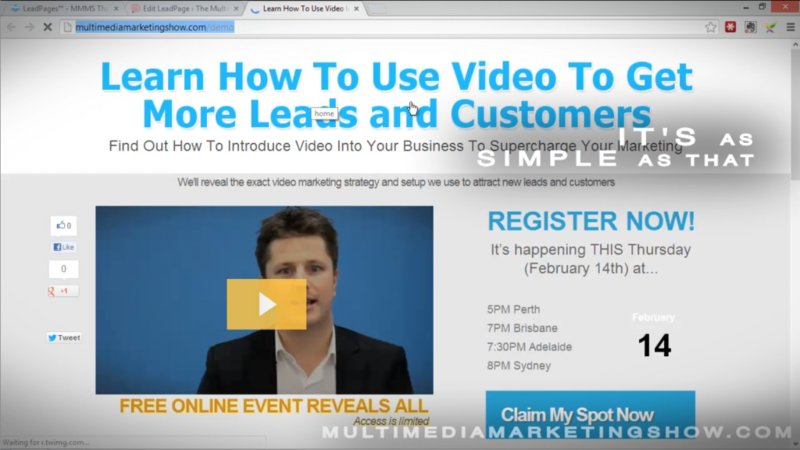 Now let’s just click that and you’re gonna see the webinar has actually been run but it takes you to another LeadPages™ page where you can view the webinar replays. As you can see, its super simple and you can use them pretty much in all aspects of your own site. Now I’m going to quickly show you how you can go about setting up a couple of pages. Let’s look at that first one. Let’s look at creating a thank you page. This would be as easy as uploading your logo or changing your logo. It tells you everything you need to do so you can style things, you can put in your normal page settings to add a title description, keywords. You can add in your own analytics codes so it’s very straightforward and again you’ve got pretty much full control over all the styling of the pages as well. Essentially all you need to do is hover over what you want and you can change the text. You can then of course embed your video. It gives you the settings or the dimension you need to have your video. I use Wistia and I also use YouTube in conjunction with LeadPlayer so you can also embed them here as well which is fantastic. Embed on Facebook which is just adding in your embed code there and as you can see, this is incredibly easy. All you would need to do then is save to my pages. We’ll just a quick look we can see that we’re there, we’ve got everything embedded. I’ve made those quick changes, which has taken less then five minutes, so I’ve saved it. 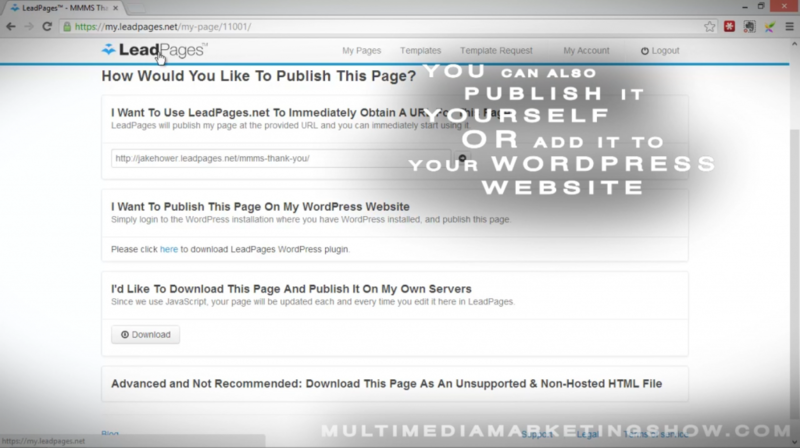 It brings you to this page and the fantastic thing about LeadPages™ is you can use it straightaway. All you need to do is click this button and it provides you with a URL which you can use to add into your opt-in conformation email. I can send them back direct to this particular page which is fantastic, that’s live. The other thing you can do very easily is you can download it to your own server and publish it yourself via HTML or you can add it into WordPress incredibly quickly and easily. I’m going to show you know how I do that. You install a little plug in of course, installing WordPress plug in is very straightforward and then end up with these LeadPages™ here. Now as you can see, I’ve implemented so many different things across here so to add a new one, it’s as simple as clicking as add new. The normal page will just be as it, a home page will convert your home domain to this particular page and a WelcomeGate will show whenever anybody is going to your home page for the first time. It’s essentially asking people to opt-in. The beauty is it won’t be showing that page again as long as I have cookies. All you would need to do here is you chose the LeadPage you want to display, you create the URL you want to show it as and then you can hit publish. That’s done so we can just quickly view that page. You can see there, demo it’s there, it’s up and it’s live and that’s as easy as it is. Now, one thing I really found as being fantastic is the ability that I have to redirect people to different pages. Where this has been useful to me, I direct people to webinar signup pages or opt-in pages. You can see here webinar US and webinar were up team pages. Now the webinar has been run so I’m actually pointing them to different pages now. To do that it’s as easy as clicking on the page that we’ve setup. Again, it’s demo and you just change the LeadPages™ you want to display. Publish and you’ll now see that that becomes the new page. It’s fantastic, it’s so easy to use, an incredible tool. I want to show you some of the other fantastic things that I really love. Now for things like an opt-in page, let’s take a look at some pages which I have it setup for. We want to add in a squeeze page. This is what people get sent to. They click this, they’re asked for their signup. Let’s have a look and see how that particular page is setup. It’s the exact same manner, its point and click. The only difference is that you need to add in your opt-in. Now you just click your opt-in integration or click this button here. You then have your different mail providers which you can use. Now I’m an Infusion soft user but also in some cases, it may be Mailchimp so you can chose whatever provider you want and it will bring up a list of your lists that you want to sign people up into if you’re looking at something like a Mailchimp. All you have to do is select that particular list. In Infusion Soft, it shows me that the opt-in forms that I can use, so I just chose the one that I’m looking for and that’s it. You just hit okay and you’re done. 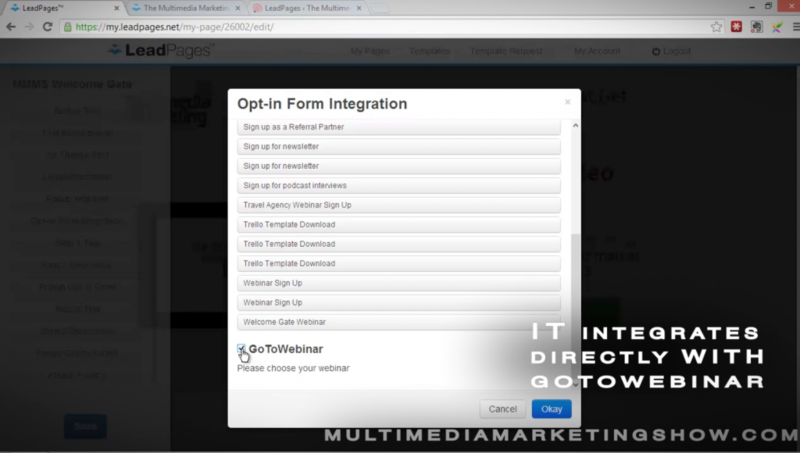 Now the other integration which is fantastic for webinar pages is it integrates directly with Goto Webinar. That would be as easy as clicking a box here, just like you’ve done up here. It would then display a list of your upcoming webinars which you just click yes, hit okay, hit save, and you are done. LeadPages™ is incredibly easy. It’s something you can run your entire business with just this and something like Mailchimp. Let’s see this in action on my site. I land on my home page. If I was visiting for the first time, I’d be directed to this particular page which is essentially a WelcomeGate. It’s asking me to up team into this free training video. You opt-in quite easily. You can also skip it by just clicking here and it will then take you to the site. You’ll see here, get your free video training, just click that to get instant access. It’s going to direct me back to a similar page, so that’s fantastic as well. You can easily integrate them and send different people to different places. Some other things I’d like to point your attention to is their adding new templates every week. Signing up now, you’re going to get access to all of this and you’re going to immediately see the results. The effect on conversions for signups across my sites has been substantial so you’re going to see similar results I dare say and as they add new pages, you’re going to find that you’re going to rely on this more and more. It’s incredibly quick, it’s fast, hosted on Google servers. Clay and the team at LeadBrite test and test and test all of these pages. They’re speaking with industry leaders, all the time. They are also getting the marketing intelligence of what converts so these pages work. That is incredibly important to someone like you and me as business owners who don’t have: A the level of traffic required to do this level of testing and B who don’t have the time to be messing around dealing with developers and getting pages implemented. A, it’s costly and B, very time consuming so this product really helps to speed up the process while maintaining a really high level of professionalism that will look fantastic and again super speedy and they convert well. I hope you found that review helpful. I certainly know that I could run my entire business with just this tool. With something like Paypal and something like and email autoresponder like Mailchimp or AWeber, that’s how good this particular tool is. I would employ you to go out and purchase it. You are going to save time by utilizing it. You’re going to get well designed pages that convert. Clay Collins recently announced a brilliant new feature for LeadPages: simple, one click integration of your LeadPages landing page with your Facebook Pages. Watch the below demo video from Clay for further information. As another bonus if you go ahead and purchase LeadPages™ through the link below, shoot me an email, jake@fuzed.dev.fastgrowth.io and I will send back to you a copy of every single page that I have rolled LeadPages™ out across all of my business so you can see exactly how I’m using it which would certainly give you some ideas of how you can potentially utilize it yourself. This is essentially a cheat sheet setup guide for you, looking at my pages. I’ve spent over 10 plus hours setting up all of these different pages and even, not necessarily just setting them up, but even just conceptualizing and finding out where I can use the product. If you sign up below and you shoot me an email, I will give you access to all of these pages and of course, you’ll then have my email address you can shoot any questions you have to me as well. Thanks for tuning in for this episode. I hope you’ve enjoyed it. Leave some comments below if you’ve got any comments. Tune in again next week. I’m going to show you another tool which I use on a daily basis to run my businesses. Thanks very much and speak soon.